Providence PlayCorps is an innovative collaboration between the Partnership for Providence Parks, Providence Children’s Museum, and the City of Providence’s Healthy Communities Office and Department of Parks + Recreation to activate low-income neighborhood parks across the city with free play, art and creative exploration, in conjunction with the free federal summer meals program. Teams of trained play facilitators are a consistent presence at neighborhood parks throughout Providence. They provide activities and materials to engage neighborhood children in physically active play, improving the overall safety of the parks while encouraging more children to take advantage of free, nutritious summer meals. 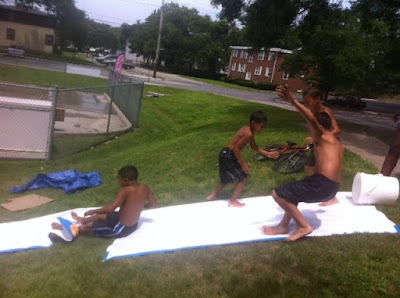 By working in neighborhood parks, PlayCorps fills the gap when school is out to ensure that Providence youth are active, safe and healthy over the summer. Join PlayCorps members for an exciting summer of play. Enjoy a free summer meal (18 and under) and build forts, blow bubbles, make art, make music, explore nature, make friends and SO much more! For updates and activity announcements, follow PlayCorps on Facebook and Twitter. Providence PlayCorps 2015 is supported by Blue Cross & Blue Shield of Rhode Island, the City of Providence’s Department of Parks + Recreation and Healthy Communities Office, a Health Equity Zone grant through the Rhode Island Department of Health, the Partnership for Providence Parks and Providence Children's Museum.